In its now famous 2001 “BRICs” thesis Goldman Sachs argued that Brazil along with Russia, India, and China would come to play an increasingly important role in the global economy due to demographic and other economic factors. Over the past decade Brazil has managed to achieve robust economic growth and has gained increasing attention and investment. Brazilian companies have also taken advantage of favorable global macroeconomic conditions to expand their operations across not only Latin America but the world. 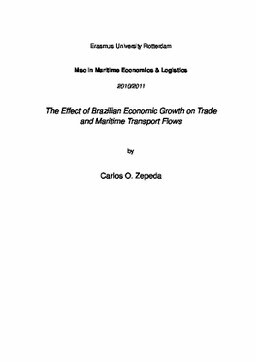 This thesis examines the impact of Brazilian economic growth on trade and maritime transport flows and makes projections of how Brazilian economic growth is likely to continue impacting trade and maritime transport flows over the next decade. This thesis aims to provide insight into the factors that drive Brazilian trade flows and how these factors are likely to impact the “geography of trade” through gravity analysis and use of the Global Simulation Model (“GSIM”). In doing so this thesis compares Brazilian trade patterns with global trade patterns in order to determine whether Brazil differs from global trends. This thesis argues that like global trade flows, Brazilian trade is mainly driven by GDP growth and that GDP is the most reliable predictor for Brazilian trade flows. It also argues that Brazilian trade flows will continue to experience a geopolitical shift towards Asia and other emerging markets leading to a more diversified pool of trading partners. Despite continued growth, however, Brazil is unlikely to have the same impact on maritime trade that the economies of East Asia have had.